In school, most children learn a great deal about how life begins—how the human body grows and changes throughout its life cycle, but rarely how the life cycle comes to an end. Talking about dying and death is difficult at best in our culture, and even as adults, having an honest discussion about the physical and emotional aspects of dying, or planning for the event itself, comes only when absolutely necessary, if it is discussed at all. “There’s a taboo out there. We don’t talk about death and dying in our society. It’s a challenge just to get the message out there,” said Jenny Brasington, executive director of Hospice Care of the Lowcountry, where these discussions are encouraged and treated with a great deal of dignity and respect. Dying and death are an undeniable part of life, and even before we go through the experience ourselves, relatives and friends will. For 30 years, Hospice Care of the Lowcountry has been a support, a partner, and a comfort to terminally ill patients or those no longer seeking treatment and their families, making the process and the discussion about this difficult time more manageable. From its completely volunteer roots, Hospice Care of the Lowcountry has grown to be the largest fully certified hospice, palliative care, and home health agency in Beaufort, Jasper, and Hampton counties. Hospice Care of the Lowcountry is continuing its tradition of seeking to provide as much support as its resources will allow by adding two new programs: the We Honor Veterans program is in partnership with the National Hospice and Palliative Care Organization, in collaboration with the Department of Veterans Affairs, and Pet Peace of Mind is an extension of their existing program Hos-Pets, in conjunction with the Banfield Charitable Trust. “The two new programs put a name to something that was somewhat already in existence within our organization. I think that our staff is particularly intuitive and understands what people need. Whether that’s honoring a veteran or helping a hospice patient and their pet stay together; they’ve always done that,” explained Darlene Schuetz, director of community relations. With 25 percent of those who die each year in the U.S. being veterans, Hospice Care has recognized the importance of better addressing their unique needs. The organization’s staff is in an ongoing program of education for the We Honor Veterans program. “It’s about going above and beyond understanding the veteran’s special needs,” Schuetz said. Hospice Care of the Lowcountry’s social workers are trained to delve into the client’s particular situation during the initial contact, and other team members have an ongoing protocol of evaluation. According to Brasington and Schuetz, there may be issues or life circumstances that the patient hasn’t talked about in a long time, or in the case of veterans, quite possibly have never talked about them. “There are many things that can affect people towards death that we don’t even think about, and those could be very pertinent as to how the process is for them. It helps that the patient understands that the team cares about that era in their life, when other people might not have,” Schuetz said. According to Brasington, one of the specific goals of the We Honor Veterans program is partnering with the Veteran Administration Hospital in Charleston and the Naval Hospital in Beaufort. “These facilities are able to provide guidelines for different war-era veterans, what environmental issues they may have experienced, and what we need to look for,” she said. Additionally, Hospice Care of the Lowcountry wants area veterans to understand their end of life options. With 90 percent of people saying they would prefer to die in their own homes, it is important that veterans understand that they can maintain their VA benefits while receiving hospice care, whether at home or in a medical or extended care facility. We Honor Veterans enhances Hospice Care of the Lowcountry’s ability to act as liaison between the patient, his or her physicians, and the Veteran’s Administration during the end-of-life process. Whether honoring veterans by simply acknowledging and listening to their stories, arranging for more formal recognitions, or even facilitating a video memoir, the goal is to provide the individual with compassion and care up to the patient’s last moments. Hospice Care of the Lowcountry is also expanding on its already existing Hos-Pets program, where trained and certified dogs make visits to homes and care facilities, with its new program, Pet Peace of Mind. 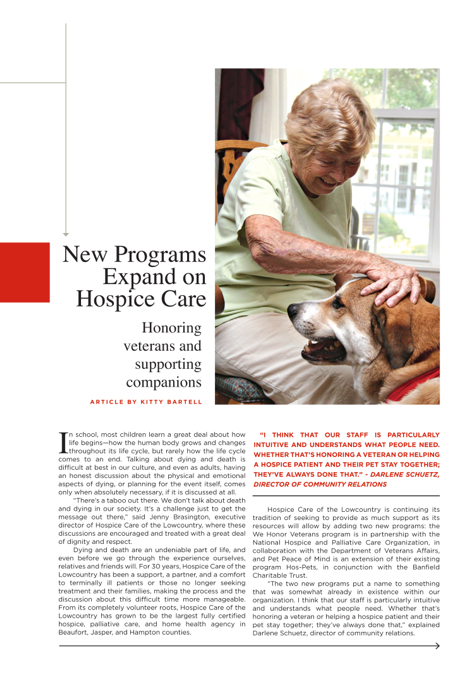 “We recognized that keeping hospice patients and their pets together is very important. We were awarded a grant through the Banfield Charitable Trust to get the program started,” Schuetz said. Hospice team members make ongoing observations and recommendations based on the household pet’s needs. “Sometimes the dog needs grooming, or the litter box needs cleaning. The dog may need to be walked or it may be time for vaccinations. We will even help give the patient peace of mind by helping to find homes for pets in partnership with some local facilities that will provide foster homes or boarding while arrangements are being made,” Schuetz said. Like much of what happens at Hospice Care of the Lowcountry, the behind the scenes work is done by a team of over 170 volunteers, Brasington said. The permanent staff of nurses, doctors, clergy, and executive and administrative staff could not do what they do without the support of the corps of volunteers, where new recruits are always welcome, and their dedicated board of directors who volunteer a great deal of their time and talents to the organization. As Hospice Care of the Lowcountry continues to grow, it is always in fund-raising mode with the goal of providing a wider range of services to area residents in need of end-of-life care. Exciting events are planned throughout the year. This past month Light Up the Links: A Night Golf Event was held at Spanish Wells Golf Club. On November 7, Port Royal Plantation Club will host a Worth New York Fashion Event in conjunction with Forsythe Jewelers. February 2013 will bring the organization’s annual Hospice and Hearts: A Red Carpet Affair. Guests will dress in Oscar fashion, prizes will be awarded, and bachelors will be auctioned. 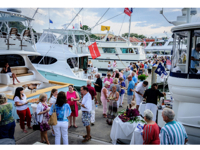 Finally, on the first Sunday in May, the annual Yacht Hop at Harbour Town Yacht Basin in Sea Pines Resort will provide tours of spectacular yachts, wine, hors d’oeuvres, music, live and silent auctions and more. Hospice Care of the Lowcountry continues on its mission to grow and provide support and care to patients and their families during one of the life cycle’s most difficult stages. According to Brasington, the true reward and the message that is most important to get out, is that in most cases the family says, “I wish we’d called sooner.” Pretty gratifying for the entire team. Hospice Care of the Lowcountry is a not-for-profit 501 © (3) hospice and palliative care organization serving Beaufort, Jasper, and Hampton counties since 1982. Its mission is to provide comfort care and pain management while valuing dignity for individuals and their families through compassionate, physical, emotional, and spiritual care. For more information, call (843) 706-2296 or toll free (877) 681-7814, or visit hospicecarelc.org.